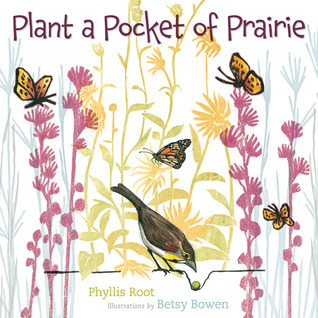 Plant a Pocket of Prairie by Phyllis Root begins, “Once prairie stretched for thousands of miles an ocean of flowers and grasses, a sea of sky, home for bison and elk, prairie chickens, borrowing owls, five-lined skinks, Plains garter snakes and Ottoe skipper butterflies. Almost all gone now to farm and town and city even before we knew all the things a prairie could do.” The book shares the life that could once be found in Minnesota’s native prairie – life of all kinds great and small. Full of “what -ifs” this book suggests that we pay attention to the habitat around us, understand it and care for it. We will never be able to recreate the prairie we have lost – but we could plant a pocket and see what comes because of it. And what would happen if the “pockets” grew together? There’s no telling who will come. The information contained in the end pages of this book are what makes it invaluable to intermediate and middle grade readers. Focused solely on the prairie, the information can be applied to all habitats and ecosystems. What ecosystems are threatened where you live. What is there, and what can you do to understand the interdependence of plants and animals as a way of keeping it from slipping away. The fact I found most striking in the end pages is that the 40% of the United States was once covered by prairie. Now there is less than 1% of the prairie left and that makes it the most endangered ecosystem in the world. Reading Plant a Pocket of Prairie makes you rethink about the impact of modernization and how we barge in without really knowing the impact or cost. There is a reason this book base been talked about and reviewed so often. There is something for every reader to thinking about. Enjoy!